Don’t overlook Corey Dickerson. In fact, keep checking our rankings – we may move him up there. Corey Dickerson will be 27 in May and he just got traded to the Tampa Bay Rays where he’ll be playing alongside a bunch of talented offensive and defensive players (Kevin Kiermaier, Steven Souza, Jr., Logan Morrison, Logan Forsythe, Evan Longoria). For fantasy baseball, we’re really only concerned with Dickerson’s offensive potential, and we see that there’s a lot of it for him in 2016. 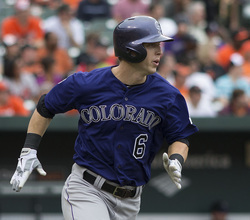 Corey Dickerson’s 2015 campaign was cut short by injuries as he only played in 65 games. But in those 65 games, he managed to hit 10 HR with 31 RBI and 30 runs scored. Project that out and you’re looking at a 24 HR, 75 RBI, 75 Run season. Keep in mind, he also hit .304, but before you say, “Yeah, but that was only in 65 games,” he also hit .312 the season before in 131 games. One interesting note is that, down the stretch, and after recovering from injuries, Dickerson only hit .282 from September 8th through October 4th, but he hit 5 of his 10 total home runs along with 13 RBI and 14 runs scored, so almost half of his offensive production came down the stretch. Now, he also struck out 21 times in those last 22 games, which is significantly above his average strikeout rate. This means that, even while he was somewhat-clumsily getting his swing back from missing all of August, he had, somehow, improved his power production. Not that he’ll be 27 this season, we think he’s primed for a breakout year, even in Tampa Bay instead of Colorado. After being traded to the Tampa Bay Rays, Corey Dickerson may be in an even better situation than hitting in Coors Field. *His .304 batting average in 2015 is actually not a fluke; he hit .312 in 131 games played in 2014. *Corey Dickerson turns 27 in May, and 27 is a prime age for a breakout year. We think he's too young to be in the "always injured" category. *Only 74 runs and 76 RBI in Colorado (in 2014) while hitting .312 with 24 HR is kind of perplexing, but his pace last year wasn't any better, either. Don't expect that number to suddenly rise - but if it ever does, it will be this year. Expect 25 HR, 80 Runs, and possibly 90 RBI (although 80 is more realistic) out of Corey Dickerson in 2016. We’re not so sure he’ll hit over .300, but there’s really no reason to think he won’t, given his average the past two seasons. Still, the injuries may be lingering a bit, so be happy with .280 and be ecstatic with anything higher.